Zion National Park has some fantastic rock structures and colors for some unbelievable scenic beauty. Activities to consider while here are but not limited to: backpacking, biking, camping, fishing, four wheeling, hiking, horseback rides, photography, river running, star gazing and watching wildlife. Hikes and Walks: Watch out for falling ice and slippery conditions. Most trails have drop-offs where you must be extra careful to watch your footing. Always stay back away from the edges. People uncertain about heights should turn around if they come to drop-offs that bother them. When hiking, stay on established trails and watch your footing at all times, especially at overlooks and near drop-offs. Watch children closely! Loose sand or pebbles on stone are very slippery. Be careful of edges when using cameras or binoculars. Never throw or roll rocks, there is a good chance that hikers are below! Don’t endanger their lives! Be alert for rock falls and landslides. Although they rarely cause injury, they do occur frequently. The Narrows of Zion Canyon is one of the park’s most popular and strenuous, off-trail hikes. Hiking through the Narrows is a 15-mile trip requiring at least one full day. Much of the trip involves wading through the Virgin River. The Narrows may be closed because of the threat of flash floods. Permits are required for trips through the length of the Narrows and its tributaries. Frozen waterfalls, sparkling ice crystals and white frosting on rusty peaks are some of the treasures awaiting hardy winter hikers. However, conditions change rapidly and constantly; hikers should be flexible and plan to turn back if trail conditions are unsafe or falling ice is a hazard. 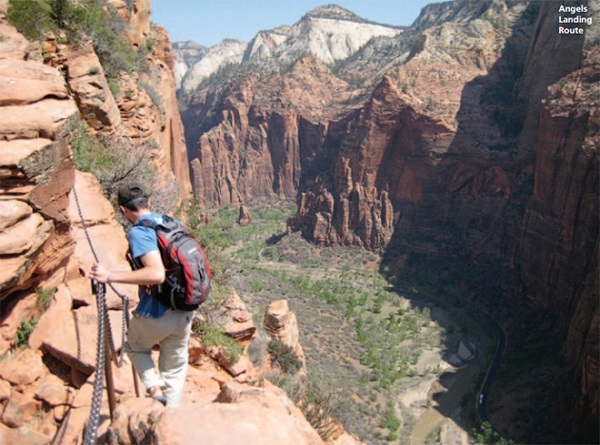 The Zion Canyon trails usually have patchy snow, ice, or mud from winter through spring. Portions of Emerald Pools, Weeping Rock and the Riverside Walk are hazardous when icy and may be closed to hikers. The Sand Bench and Watchman Trails are usually snow free during the winter, but are often muddy in spots. Longer trails such as Observation Point, Hidden Canyon and Angle’s Landing are often hazardous due to ice. Canyon hikes such as the Narrows are not recommended in winter and early spring due to cold water, high runoff and snow/mud covered access roads. High country trails including West Rim, Wildcat Canyon and East Rim are covered with up to three feet of snow in winter and are muddy and or icy in the spring. Kolob Canyons trails are often quite snowy. Snow depths can vary from one to several feet of snow, requiring snowshoes for easier travel. Avalanches often pour down the steep canyon walls during and shortly after snowstorms. Falling ice and snow when rising temperatures cause melting, are also hazards back country hikers and skiers may encounter. The lower desert trails, including Chinle Trail and Coalpits and Huber Washes are good for winter hiking during dry weather. This is the most accessible area for winter hiking and backpacking. Cross-country skiing, snowshoeing and snowmobiling opportunities exist in the higher elevations of Zion and nearby Cedar Breaks National Monument. For more information check at the visitor centers.